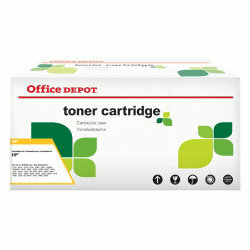 Office Depot Toner Cartridge HP CE400A 507A compatible. This toner cartridge is suitable for the following Hp printers: HP Color LaserJet M551DN M551N M551XH M570DN MFP M570DW MFP MFP M575C M575DN MFP MFP M575F. Also it has a capacity of approximately 5 500 pages: at 5% coverage. Color: black. Office Depot toner cartridge CE252A. For up to 10.500 sheets maximum 5% coverage. Colour: cyan. Compatibility: HP Color Laserjet CM 3530 FS MFP CP 3520 Series CM 3530 MFP CP 3525 DN CP 3525 N CP 3525 X CP 3525. Office Depot toner. Equal to the original HP CE505X. Capacity (5% coverage): 6 500 pages. Colour: black. Compatibility: Laserjet P2055.